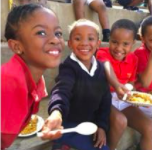 Wonderbag Founder and CEO, Sarah Collins, traveled with the Wonderbag team to Thembelihle Primary School in KwaZulu-Natal, South Africa to activate Wonderbags within the community and serve hot Briyani for just in time for lunch. Thembelihle Primary School is an independent school that provides quality education to young children from disadvantaged backgrounds in the village of Howick in the Province of KwaZulu-Natal in South Africa. The school is a non profit organisation and caters for almost 300 children in grades RRR through to grade 7. Most of the children come from informal settlements in Howick such as Shiyabazali. The people from these communities are largely unemployed and have moved from more rural areas in search of employment. Their living conditions are basic…. there is no running water, electricity or sewage. Many of the children are orphans whose parents are victims of AIDS and they now live with aged grandparents who survive on a small old age pension.